Standard parking in the non mandatory University Avenue painted cycle lanes. We at GoBike, the regional cycle campaign, are writing to you regarding the designs for University Avenue, which we have only recently been made aware of and seen. We are deeply concerned by the lack of safe cycle space on both sides of the road, and by the failure to design in segregation for the cycle lanes. As you will be aware from the recent public consultation on Byres Road, paint is not protection, and is most certainly not an adequate provision within modern cycling designs. It is not adequately safe for people of all ages and abilities to cycle, especially on the steep gradients found on University Avenue. Lack of physical separation from motor traffic doesn’t prevent traffic from entering the cycling space, increases a perception of danger, encourages close passes of the narrow lanes, and will often be used for parking or loading. The designs for University Avenue also appear to show no attempt to reduce vehicular through traffic on the street, which does nothing to improve congestion and pollution around the university, it’s student population, and it’s staff. With a student population where only 8.3% use cars (University of Glasgow Strategic Transport and Travel Plan 2015 Travel Survey Report), and in a city where less than half of households have access to a car (https://www.scotlandscensus.gov.uk/documents/council_area_profiles/Glasgow_City.pdf), this is clearly a misappropriation of space. Students are an ideal sector of society for potential uptake of active travel, but if you fail to make that choice safe, and if you make driving the easiest choice, that uptake will not occur. Failure to provide safe segregated cycling space in a redesign on University Avenue is at direct odds with the University’s Sustainability Strategy 2016-21 (pg 6) “We will develop our campuses in a manner that encourages greater use of active and public transport” and its Strategic Transport and Travel Plan 2016-20 which promises to “work with local authorities to improve active travel routes to and from each campus” (pg 10) as well as it’s Travel Policy Statement which states that it will adopt objectives to “improve the amenity and access routes on and around University premises for users of sustainable modes of travel” and to “positively influence the health and fitness of staff and students by encouraging more walking and cycling as a means of travel”. Further, failing to provide safe space cycling is a direct contravention of the National Transport Strategy hierarchy of priority (pg 26) which puts people on foot and people choosing active travel and public transport at a higher priority that those using private cars. Not only this, but University Avenue, which is at the heart of Glasgow City Council’s ‘Colleges Cycle Route’ will continue to be a broken link within this network if the current plans are to go ahead. Rather than a step forward to a linked up active travel network that our council promises, this will become a step back. Failing to provide for safe active travel in this redesign will create a catastrophic failure to link up an active travel network to and from new and existing schemes on Byres Road, Queen Margaret Drive, the Yorkhill and Kelvingrove Cycling Village, and the Connecting Woodside extension onto Woodlands Road. We are particularly disappointed, as the regional cycle campaign, to have not been included in any consultation on the designs for University Avenue. We have been asking around the university for some time, to provide us with information on the plans, and it is only since recently asking the council if they had any information, that we have been directed to the planning documents. Planners around the University will surely have been aware of the huge response to the public consultation on plans for Byres Road, that demonstrated just how opposed the public were to the lack of safe space for cycling and the failure to reduce through traffic, and so there should surely have been a presumption that a proper public consultation on University Avenue would get a similar response. Plans for Byres Road have now been redesigned to include segregated cycle lanes due to overwhelming public opposition to the original proposals at public consultation, and a subsequent instruction from Councillors on the Neighbourhoods, Housing and Public Realm Committee. Our streets should be made safe for cycling. 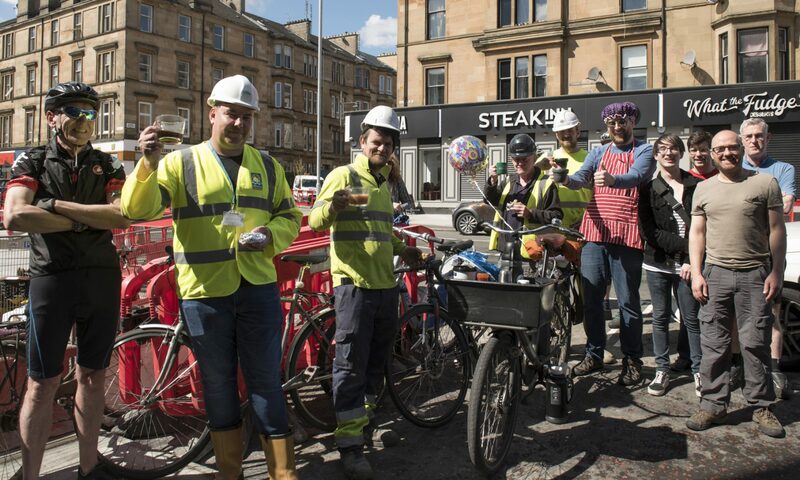 We call for a redesign of University Avenue that includes segregated cycle lanes on both sides of the street that will link in with plans on Byres Road, and that will keep options open for network extensions at it’s other ends. We cannot accept another multi-million pound project in Glasgow that fails to provide for safe active travel. Plans can be viewed here. If you also believe that these designs do not stand up to active travel promises, do not provide safe space for cycling for people of all ages and abilities, and do nothing for a greener, safer and healthier future, join us. Sunday 10th Feb, noon, Wolfson Building, University Avenue.